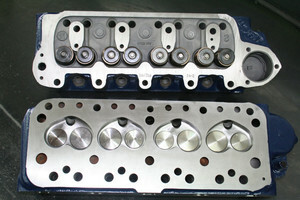 This specification of cylinder head is for the small-bore based engines with up to +0.040”/1.0mm bore sizes. The smaller bore sizes limit the size of the exhaust valve. Based on used core castings it is modified to CST current conventional road-sports style to maximise road-sports and track day/weekend-warrior performance when used with road-sports and super-sports camshaft specifications. That means optimised BHP and torque out-put through port shape and dimensions and valve throat shapes. Developed on an airflow bench and then on engine dyno/rolling roads to work with the aforementioned camshaft types along with suitable compression ratios given modern lead-free fuel specifications. High quality Serdi lead-free exhaust seat inserts are fitted.